2. Do you want first name or initials on front of cover? 3. Would you rather full name or first and middle name on spine of cover? 4. Any special requests or questions? Are you looking for a unique and personalized book to record all your baby's special moments and milestones? 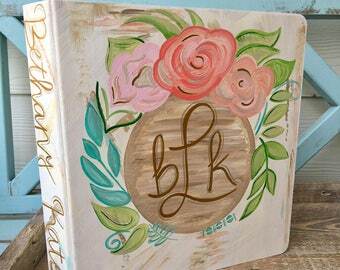 This hand painted wooden baby book is for you! I came up with this idea while looking for a special baby book for my son before he was born. Not finding anything particularly unique online, I bought a generic one from a baby store. As soon as I started using the book and turning the pages multiple times the flimsy 3 ring holes in the paper began to tear and there was no protection for the pictures or items I taped on the pages! That's when I decided I wanted to create a hand painted wooden book with custom pages (with my sketches) to match the cover theme. 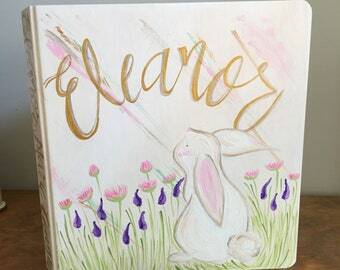 This baby GIRL book features a WHIMSY FLOWER GARDEN theme with baby's name and initials on spine and cover and includes matching themed pages printed on card stock and comes with a clear sheet protector for each page. 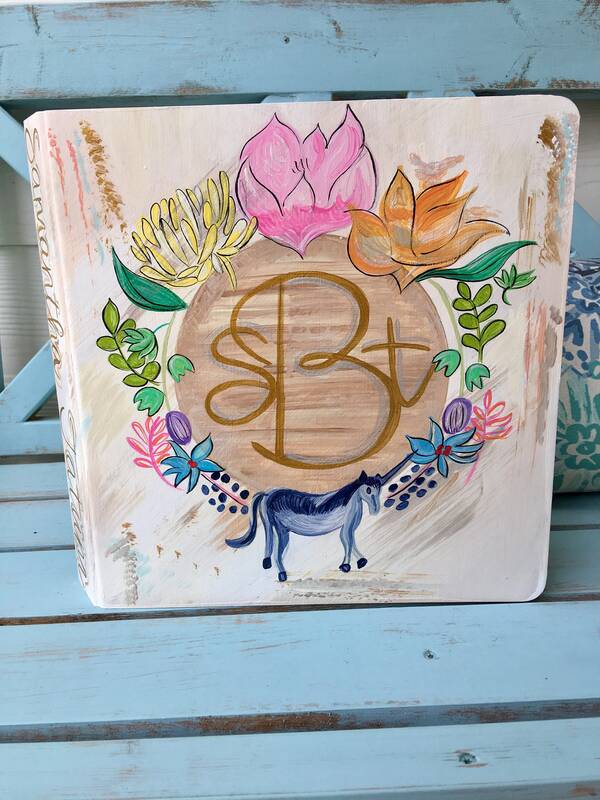 This wooden book is a 3-ring binder, so you are free to add pages or move pages around! 2. Would you rather full name or first and middle name on spine of cover? 3. Any special requests or questions? All books are made to order, please allow 1-2 weeks production time before your order is shipped! 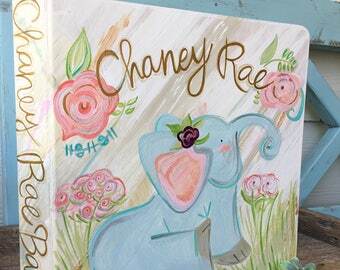 I can't wait to make your one of a kind baby book for your miracle baby! Love, love, love my new birthday book! I bought a baby book originally and loved it so much I decided to split out birthdays in a separate book. I love saving the birthday cards that are sent to my daughter and I want her to be able to cherish them later. Unfortunately, I quickly ran out of room in my baby book so I reached out and asked for a custom birthday book. As you can see from the picture it’s perfect! I can’t wait for my daughter to take these books with her when she grows up! Most amazing seller! This baby book is exactly what I was looking for! Personalized and attention to detail. If you are looking for something to cherish your child's memories this is the perfect book for you. Thank you SO much! I love our book! This one of a kind book makes such a special place to document my little one’s first year! It seems simple but is so much more than store bought book!